Bad Language in October promises to be a HORROR show as Stephen McGeagh joins us as headliner. 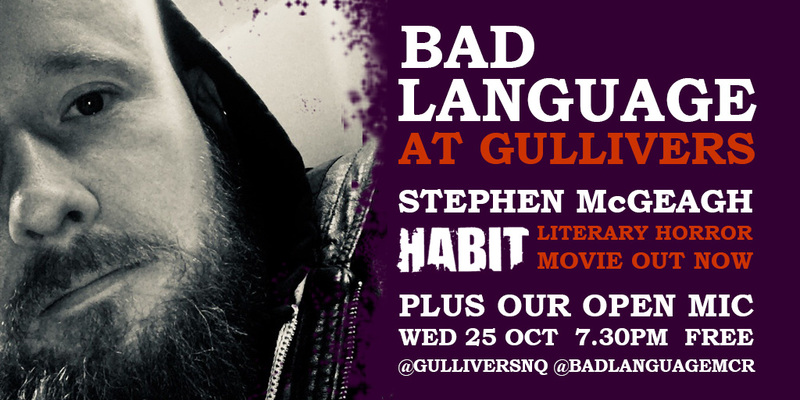 Stephen is a rare return headliner because his book Habit – featured at Bad Language nearly four years ago – is now a film currently touring UK film festivals. Come along, we’ll show you the trailer! He’s well established on the Manchester scene: he studied English at MMU before returning as a postgraduate to their Writing School and successfully completing his MA Creative Writing in 2011. Habit (Salt, 2012) is his first novel. As well as working on the screenplay adaptation for Habit (Not A Number, 2017), Stephen is a musician and lyricist with the band Colibra. If you haven’t seen us in our new home at Gullivers, do come and check out our open mic. It comprises ten readers of fiction or poetry – this month, most of our readers are brand new to the Bad Language stage. Our open mic names this month are: Bryce Main, Caroline England, Cat Blindell, Cheryl Pearson, Jennifer Lee Tsai, Ian Peek, Karl Lagen, Nicky Grant, Rosie Cullen, Tom Rowe. Wednesday 25 October 2017, 7.30pm at Gullivers (opposite The Castle), Oldham Street, Manchester. Free admission. Venue details here. Join the Facebook event here.